One bit of information no one gave me before travelling to Mauritania was that I would be asked for a fiche. Basically, a fiche is a form that has all your travel information on it. Having a fiche while travelling Mauritania is not completely necessary, but having a couple copies on you will make your life a whole lot easier. Basically, the Mauritanians just want to keep track of the movement of foreigners in the country the best they can. If you don’t have a fiche, every once and a while on the highway you’ll have to stop and fill out a bunch of information. If you have a fiche, they’ll just take a copy off your hands and you’ll be on your way in no time. 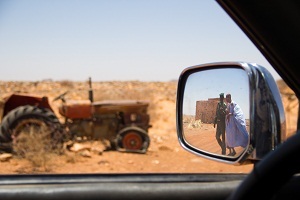 I was asked for a fiche in Mauritania a number of times, especially at military check points in the more rural areas. I think between Atar and Nouakchott I gave out about 8 of them. If you can hand one over completed they’ll usually look at you quite impressed and then let you carry on without a fuss. If you don’t have one, they’ll likely ask you to have a seat in an office while they casually take down all your information. In my opinion, if you are travelling Mauritania, do your self a favour and make one of these, it’ll save you all sorts of hassle. To save you some time, I’ve created a bit of a resource which will hopefully make your trip through Mauritania much easier. Below is all the information you should include on your fiche, and I have made a bit of a template that you can download and fill out as well if you’d like. I’ve written it in French with parentheses in English. The officials will not likely speak English, so you’ll want to be sure your fiche is in French or it does them no good. To download the template fiche for Mauritania, click here. If you have any questions, need to add something, or have had a different experience please feel free to contact me via my contact page or leave a comment in the comment box below. Thank you for the fiche template! We are about to head towards Mauritania from Morocco and it is exactly what we needed. Thanks Brendan! this is really useful, and actually it would be useful too while traveling through Western Sahara. I had 10 military checkpoints, and it was like 5 minutes in each of them while they copied all passport information. Damn! I didn’t hit any checkpoint in Western Sahara when I went through. Good to know! Brandon, I am planning a trip from Marrakesh to Dakar (via Rabat for my Mauritania Visa) this year from February 5th to mid-August. Thank you for this information. I will apply for my visa about 15th of February. It looks like I may trying to travel through Western Sahara during the Sirocco Winds in March. I could wait until April to enter Western Sahara by hanging out on a beach in Mirleft 🙂 . But then I would need to request my Mauritania visa to not begin counting until 1-1/2 to 2 months after my application. Not sure if they would allow that. 1. do I need to have a copy of my photograph as well as a copy of Muaritania visa for each Fiche? That will mean, 10-15 copies of Fiche will be a 20-30 pages with 15-20 photographs! 2. I was planning to get a visa on border – that mean, I have no way to keep copies of visa with Fiche. I will need to make photo copies of visa near the border to include with the fiche! PS: Could not find your contact page!